When Bunn developed the first commercial paper coffee filter it understood that the porosity and filter structure is critical to delivering that same great tasting cup of coffee. They are continuously checked to assure proper porosity, flow rate and proper structure. 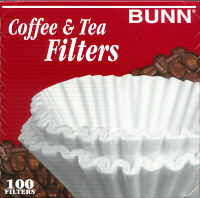 With the investment you make in gourmet coffee, make sure you brew all the flavor through Bunn Coffee Filters. (This filter is for Home Models).